Bite into a store-bought banana, and you won't find any noticeable seeds. Commercially grown bananas are genetically bred to prevent seed growth -- those tiny black dots in the center of bananas are the remnants of ovules that won't become viable. But wild bananas do have seeds, and depending on the type, those seeds can be quite large. This doesn't mean you can, or should, plant a banana seed -- most new banana plants are produced by the mother plant. Bunches of bananas growing on a tree. Banana plants (Musa spp.) are tree-like in appearance -- so much so that they are often referred to as trees. Botanically, banana plants are actually herbs, with succulent stems through which the leaves grow and uncurl at the top. Hardy in U.S. Department of Agriculture plant hardiness zones 9b through 11, they add a tropical flair to almost any landscape and thrive in moist but well-drained soil. Banana plants will grow in full sun or part shade and get quite large -- up to 30 feet tall. Some bananas, depending on the species, can have quite a few seeds -- even to the point that the fruit is more seeds than flesh. The seeds can be rounded or angled and average between 1/8 and 5/8 inches wide. The seeds are only used for cultivation purposes by experienced breeders and not by casual gardeners. Instead, most people who want to grow bananas harvest suckers, not seeds. Banana plants grow from rhizomes -- horizontal, underground roots. In fact, most banana plants produce a lot of suckers, or baby banana plants. After the mother plant produces fruit, it dies and is replaced by the largest sucker. It's not a good idea to let a lot of suckers develop. In any given year, only three or four should be growing: the oldest, which produces flowers and fruit; the next oldest, which should be about half the size of the oldest; and then a couple that are between 6 inches and 3 feet tall. Cultivating the baby plants that sprout naturally from the rhizomes of the mother plant is the best way to grow a new banana plant. 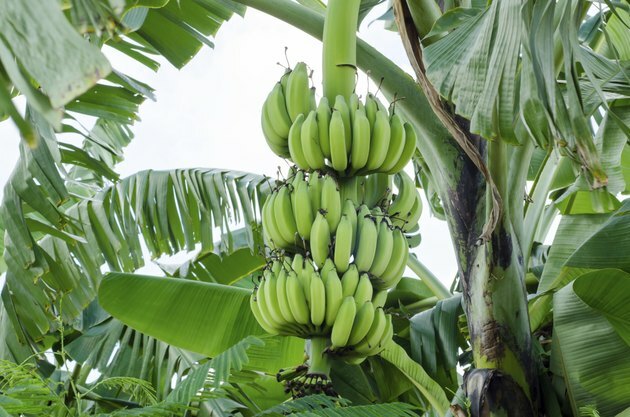 Rather than growing banana plants from seeds, growers remove large, healthy suckers -- these are usually between 4 and 5 feet tall -- from the mother plant by cutting the rhizome with a spade. Then, the new plants -- which are still attached to a cut section of the rhizome -- are potted and sold. Can Bamboo Regrow From Cuttings?